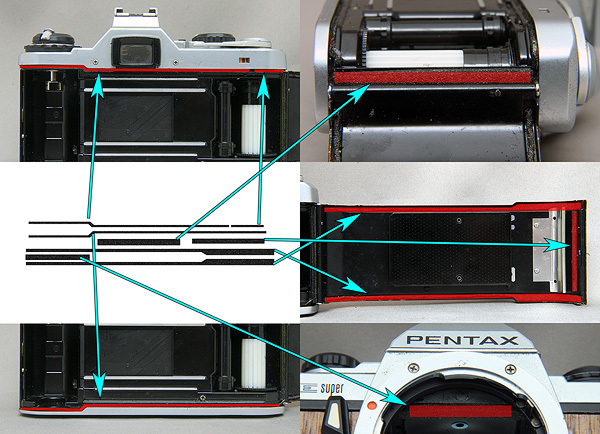 This is Pentax ME and Pentax ME Super's Light Seals foam (backdoor gasket sponge and Mirror Cushion), replace kit. This seal kit covers seals, shown as above image. it and put it straightway to your camera. Let's take a look that how many hours you have to spend for measuring foam seal size and cutting them if you do it by yourself? (Actually I spent 2 hours for measuring data and cutting moulds). worry if you waste one or two foam kit. we are sure that you will install perfectly for the 3rd time. 1,2. Remove the old light seals and clean up the residue of old seal from your camera with alcohol or benzine. 4. Use cotton swab or paint brush to rub alcohol or water on the adhesive (sticky) side. 5. place the seals onto the narrow channel. This kit only fits to Pentax ME Super, and does not fit to any other cameras.